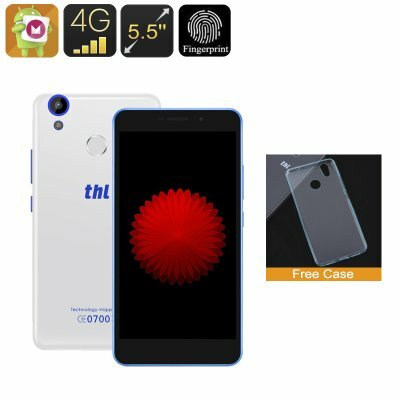 Successfully Added THL T9 Pro Smartphone - 5.5 Inch HD Display, Android 6.0, 4G, Dual-IMEI, Fingerprint, Quad-Core CPU, 2GB RAM (White) to your Shopping Cart. Equipped with a large 5.5 Inch HD display the THL T9 Pro smartphone provides a marvelous visual experience, allowing you to enjoy all your favorite media in stunning quality. With this Android smartphone your world will no longer be constrained by a limited view on a small display. Whether you use it to play games, enjoy the latest Apps, browse the web, or watch an HD movie – the THL T9 Pro is guaranteed to live up to all your media demands. Running on the latest Android 6 Operating System this Chinese smartphone offers the latest features the mobile industry has to offer. Enjoy a remarkably smooth user experience and download the latest Applications. With Google Play installed you will have access to millions of the latest apps, games, movies, and more that will provide you with countless hours of mobile entertainment. Additionally the phone’s ultra-fast 4G connectivity provides you with the fastest data speeds out there, letting you browse the internet and stream online movies in lightning speeds. Featuring a powerful Quad-core CPU clocked at 1.3GHz along with 2GB of ROM this Android smartphone is the perfect device for those of you who love multi-tasking. Backed up by a Mali-T720 GPU and 16GB of internal memory the THL T9 Pro lets you run graphic-intensive games without experiencing any interruptions. With the possibility to add a stunning 128GB in external memory you can be assured that with this Chinese smartphone you’ll never run out of space for all your Apps, videos, and files. Offering Dual-SIM slots and two IMEI numbers the THL T9 Pro allows you to be connected to the outside world through two different phone numbers simultaneously. Additionally, you can connect to two different network providers, ensuring that where ever you’re headed you will never be left standing without data. Its state of the art fingerprint technology features 360-degree accuracy meaning that it will instantly recognize your finger no matter how you place it on the sensor. In total this magnificent smartphone lets you save five different fingerprints, each of which can be programmed to open a different application. From now on you no longer have to navigate through your smartphone and search for the application you want to use as all your favorite files can be easily opened by the touch of a finger. The THL T9 Pro smartphone comes with a 12 months warranty, brought to you by the leader in Android Phones as well as wholesale electronic gadgets.. I recieved the order .Thank you very much. Excellent product.